Recently, I had some extra mushrooms on hand that I didn’t want to go bad, and so I started looking for something I could do with them. I didn’t feel like cooking some big dish, and I wanted to do something new with mushrooms that I hadn’t tried before. So, I started scouring the Internet, in search of some ideas and inspiration. Leave it to Martha Stewart to suggest the idea of marinated mushrooms. It was just the kind of recipe I was looking for – quick, easy, and something that I could just pop in the fridge for later devouring. It took me just about 10 minutes to create my version and put it all together, and they turned out fantastic! Most marinated mushroom recipes call for more oil, but since this was one of my Weight Watchers Recipes, I cut it down to just 2 tbsp. Most of the oil doesn’t get consumed anyway, so if you wanted to count this recipe as 0 Points, you technically could. But, I always like to err in favor of weight loss, so I counted the oil and calculated it into the Points. Still only 1 Point per serving. My husband sliced some of these up and put them on his salami and cheese sandwich, which was delicious. But I like Martha’s idea of serving them with some olives and sweet peppers as an antipasto course. Of course, I also loved just eating some straight up as snack too. I’m sure you could all come up with some really awesome ways to use them. These marinated mushrooms are definitely something I’ll be making again. Thanks, Martha! These tangy little mushrooms make an excellent topping for a sandwich, or eaten alone like a pickle. Another great idea is to combine with olives and sweet peppers and serve with cheese and salami as an antipasto course. Wash mushrooms, and place in a large mason jar. Whisk together all remaining ingredients in a small bowl. 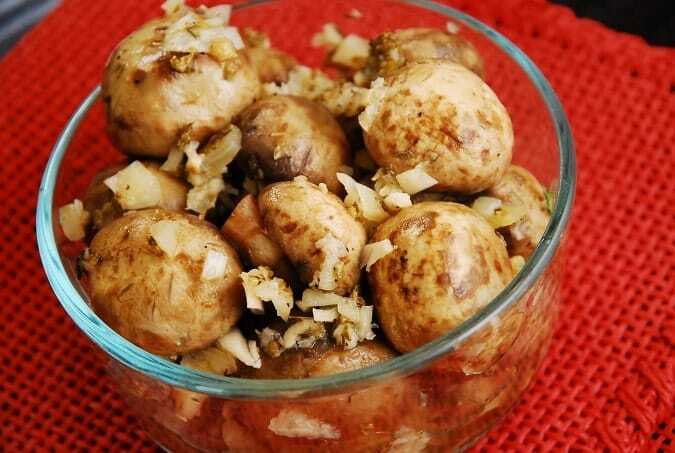 Pour marinade over mushrooms, close with lid, and shake gently until marinade covers all mushrooms. Refrigerate overnight. Let sit at room temp at least 15 minutes before serving. This is a keeper!!! Delicious light and tasty. Thanks so much for sharing!